The Curious George bookstore in Harvard Square is closing, according to this report in Publisher's Weekly, the second bookstore in the square to shut its doors in just a few weeks. Just last month, the Globe Corner bookstore announced it is closing at the end of this month (here is a link to its latest newsletter). 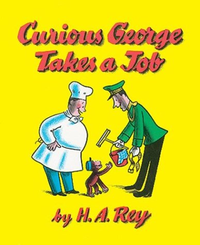 Curious George Books and Toys as founded in the mid-1990s by Hillel Stavis and Donna Friedman, in a tribute to their friends, Margret and Hans Rey. They were the authors and illustrators behind the mischevious monkey and his best friend, the unnamed Man With The Yellow Hat. According to the PW story, the owners of the bookstore needed $200,000 in donations to keep the store operating. For nice background on the Reys, here is a story by Mark Feeney from five years ago when Boston Mayor Tom Menino proclaimed Curious George Day.